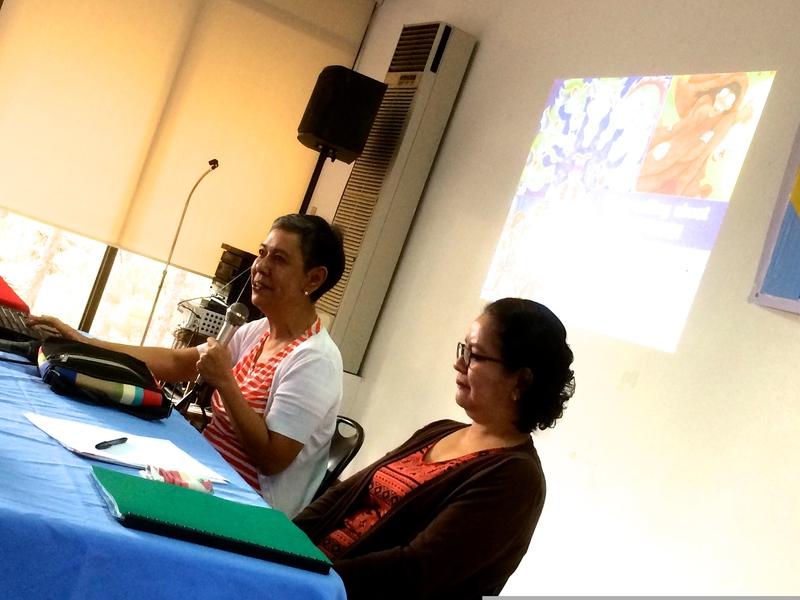 ONE OF the liveliest discussions we had at the recent UP National Writers Workshop in Baguio had to do with one of the oldest and yet still most current issues in writing—the depiction of poverty in fiction. A pocket debate arose over a workshop fellow’s short story, the protagonist of which was a 13-year-old boy, poor but streetsmart, who runs into some bad luck but, by the end of the story, is hit by a brain wave and dreams of opening a sawsawan, a kind of food stall, near the tricycle stand he works from. It was an upbeat ending, an uptick to an otherwise beleaguered existence, but it provoked an unexpected reaction from some members of the workshop—fellows and panelists alike—who felt that the story offered false hopes, given that it was highly unlikely that a sawsawan would provide a real solution to the systemic problem of poverty in this country. Of course, it’s typical of a UP workshop to get a response like that, and while I didn’t agree with that reading, I was rather glad about the fact that we had people on board who could look at writing and literature for more than felicity of language and agreeability of character and dramatic situation. Sharp-eyed and well-schooled critics these days can take a very long step backward and see things in stories that you or even the author never thought were there—buried or even unintended messages, hidden desires, the author’s own confused and febrile imaginings, latent ideologies. Authors in workshops—especially new ones—will sometimes cry foul at these readings or misreadings, protesting that they never intended their work to be taken that way. The bad news for authors is that, in today’s critical environment—especially in academia—it’s all fair game; whatever you write can be interpreted in any which way by anyone, and the author’s intentions are often lost by the wayside, seemingly the least important factor to consider in appreciating the story. (In this sense, a writers’ workshop may be the only place where these intentions are given primacy—we try to find out what you really want to do or say with your piece, and then try to help you achieve that purpose.) But it’s not all necessarily bad, as even hostile criticism can be insightful and helpful in the long run to the writer intent on improving his or her craft and vision. We all agreed that no one does the poor a favor by romanticizing their plight and putting a halo above their heads (instead of saying “their” I should probably say “our,” because most of us are poor compared to the few same people we keep reading about in the glossies). The poor can be as vicious as they can be virtuous; desperation and desire can drive people to outrageously evil acts, and the very poor and the very rich—and the seemingly normal middle class between them—can be perfectly capable of it. To be honest, my fiction actually deals more with the predicaments of the Filipino middle class, which for me remains the most fascinating source of characters because it’s also the most vulnerable. In a sense, the poor have nothing to lose, and the rich will always find a way to survive; but we, the middle class, entertain the most fervid and the most elaborate ambitions—we know exactly which brands and models to buy, all their technical specifications, sometimes even more so than the wealthy; we just don’t have the wherewithal. Hovering between plenitude and penury, we are one windfall away from a new house in the suburbs, and also one catastrophic illness away from utter destitution. But I’ve written about the poor and the oppressed in my own fiction often enough (that cranky fellow who keeps implying that I’m some snooty señorito who never stepped on carabao pie and who writes workshop-processed fluff obviously hasn’t read my work). I’d call myself middle-class, but growing up and well into adulthood, we hit rock bottom many times; you all know the sob story, so I don’t need to go there again to vet my poor-boy cred. What I always say and think about the poor is this: the poor are about more than their poverty. Poverty is awful and dehumanizing, but it’s what people do and how they act at a given disadvantage that I find interesting and even inspiring as a person and as an author, not the overwhelming odds themselves. I’ll leave the objective analysis of poverty to the social scientists and its alleviation to the activists; my job as a fictionist is to see and employ it as another means to understand why we do the things we do. 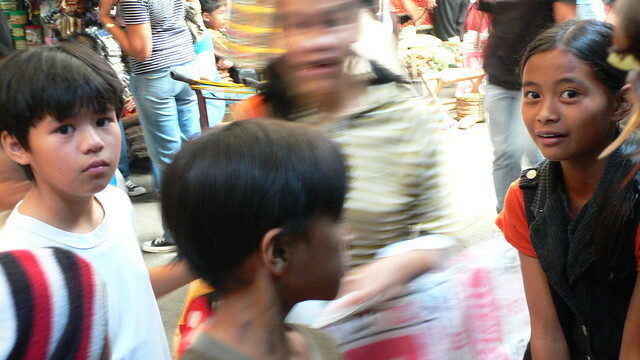 Even poverty needs to be defamiliarized, and especially so, because we think we already know it, when we might not; one exercise I’ve given my writing students is to write a scene or a story about poverty without employing the usual clichés of the sampaguita flower-seller or the shanty in Payatas. Getting back to the Baguio workshop, I took up the cudgels for the story, reasoning that I didn’t think the author intended for us to believe that the protagonist’s dream of becoming an entrepreneur would necessarily materialize and change his and his family’s life. Indeed the odds seemed stacked against him, and the objective if sad likelihood was that he would falter and fail. What grabbed me about the story was not the dark futility of hope, but the poignancy and the audacity (as Obama would have put it) of even hoping. At that particular moment, this boy thought he saw something better he could do and become—a “bossing,” as he described himself. As I’ve said, the chances can’t look too good that this boy (nicknamed “Kadyot”) would become the next Manny Pangilinan. But this is where fiction and literature diverge from the social sciences. Fiction isn’t about certainties and probabilities—if anything, the best fiction doesn’t just tell you what you already know, but challenges what you think you know, and even makes the improbable reasonable if not inevitable. I’ll even up the ante here, and ask why we should take it as an article of faith that this dreaming boy will fail, and that society can’t be changed one person, one family, and one community at a time. We don’t stop hoping or dreaming as individuals because systemic problems demand systemic solutions. The records of banks, cooperatives, and NGOs are full of these stories of lives transformed because one poor guy, maybe being a little silly, dared to dream of starting a business or learning a trade. I suspect that part of our problem as university-based readers is that we have a traditional humanist bias, gained from decades of immersion in revolutionary politics, against the notion of capitalist enterprise. Mining, for example, will always be a villain in Philippine fiction, no matter what social and economic good the industry or particular companies may produce. Call me an unfashionable neoliberal, but I can’t buy into that kind of summary judgment. Anytime we authors employ simplistic social formulas to explain and to move our characters, the fiction loses, leaving us all the poorer. ON THIS Easter Monday, a kind of resurrection story seems to be in order. A few months ago, I wrote a piece about the late painter Constancio Bernardo, a lost master and pioneer of Philippine modernism whose life’s work was then about to be celebrated with a centennial retrospective at the Ayala Museum. Little did I know that—a few weeks later, and thanks to a chance encounter at a literary festival—I would learn of yet another and largely forgotten hero of early 20th century Philippine art. The venue was the Taboan Writers Festival, which we held this year in Subic, with closing ceremonies in Clark Field. It was at Clark that I met Josie Dizon Henson—a painter, writer, and community leader who gifted me with a pair of books she had written. One was a study on Kapampangan orthography, of more scholarly interest; the other book, which caught my fancy, was a slim but substantial, privately published volume titled After the Day’s Toil: A Golden Moment in Philippine Art, a biography of her late father, Vicente Alvarez Dizon and an account of his long-lost masterpiece. Even at first mention, the name rang a bell in my mind. Two years ago, while doing research for a biography of the late nationalist thinker Emmanuel Q. Yap, I had met (at least by email) a painter named Daniel Dizon, one of Manoling Yap’s boyhood friends. Reminiscing on his friendship with the Yaps, Dan Dizon happened to mention the fact that his father had himself been an accomplished artist—so accomplished that he had won over Salvador Dali in an international competition in the US before the war. That amazing feat—and its doer, Vicente Alvarez Dizon—stuck in my memory. More on that Dali story later. I had never heard of Vicente Alvarez Dizon before, and as it happened, I would not hear of him again until I met his daughter (and Dan’s younger sister) Josie in Clark. Hearing her name, I made the connection to Dan and to her father, and she seemed delighted to learn that I knew something about her father, and brought me a copy of her book. I set the book aside for a more leisurely read, and when that opportunity arose recently, I found myself engrossed by its account of another extraordinary Filipino life. 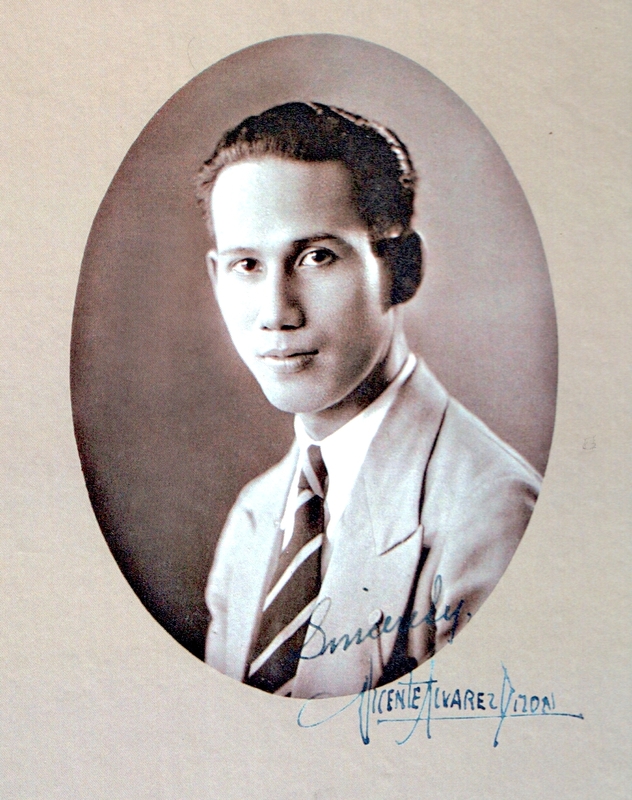 Born in Malate, Manila in 1905, Vicente graduated with a diploma from the School of Fine Arts with high honors in 1928. His talent got him a scholarship to Yale in 1934, a sojourn from which he emerged not only with his BFA but also with diplomas in Advanced Painting, Museum Administration and Art Appreciation. Back in Manila, he taught at UP, Mapua, and the National Teachers College; for the rest of his brief life, Dizon would become a staunch advocate of art education and art scholarship, tirelessly lecturing on art subjects around the country. But his finest hour—the “golden moment” Josie’s book refers to in its title—was likely the Golden Gate International Exposition in San Francisco in 1939, an ambitious, visually opulent panorama that rivaled the New York World’s Fair that opened the same year on the opposite coast of America. Within the exposition, International Business Machines, already an industry giant under its founder Thomas Watson, decided to sponsor an international art exhibition and competition featuring artists from 79 countries where IBM did business, including the Philippines. The Philippine pavilion in San Francisco actually displayed two other works by young Filipino masters, murals by Victorio Edades (assisted by Botong Francisco) and Galo Ocampo. 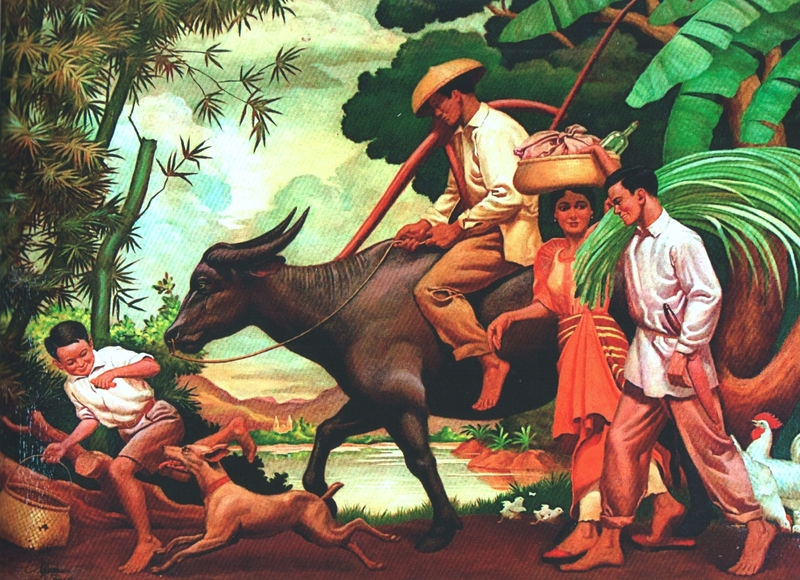 But as fate would have it, it was Dizon’s painting that IBM chose to represent the Philippines. But that’s not where the remarkable story of this remarkable painting and its creator ends. Vicente himself, sadly, would die young and penniless in 1947 at just 42, afflicted with tuberculosis, a condition that, according to Dan, also ravaged the family’s finances. His masterpiece and legacy lived on—although it was almost lost. In October 1980, the Batangas-born Filipino-American physician, Roger Pine, received a letter at his home in Princeton, New Jersey from a New York art dealer informing him of the availability of a painting with a Filipino theme titled “After the Day’s Toil,” 40 x 53 inches, signed “V. A. Dizon, 1936.” Would he be interested in looking at and possibly acquiring it? The dealer sent a transparency of the painting along. The painting had last been seen by the Dizons in 1952, when it had been shipped from the US to Manila on loan from IBM for a local exhibition. And then it vanished. Further inquiries produced no leads other than the name of a New York gallery, which had no records of it. When Roger Pine received the invitation from his dealer, he felt an instant connection to the painting, having grown up in a family of farmers. He knew nothing about the painting, the artist, nor its provenance, but he did know, especially after seeing the painting itself in New York, that he just had to have it. The dealer—who said that he had earlier tried to interest the National Museum in Manila to no avail—let the Pines have it on installment. It was also only in New York that Roger Pine realized that he had found and bought a long-lost prizewinner. Next came the trans-continental search for the painter’s family—not an easy task in those pre-email, pre-Google days. It eventually took 25 years and a bit of luck—a dinner conversation during one of the Pines’ visits back in Manila—to connect the Pines with the Dizons. In 2006, the two families met, and the following year, two generations of Dizons trooped to Princeton, New Jersey to visit the Pines and to see, once again, Vicente’s painting. It was a tearful but joyful reunion, the kind of happy ending that deserves to be written about in a book. That’s what Josie Dizon Henson has done. AND WHILE we’re on the subject of documenting Philippine art, let me note that, in celebration of the Filipino woman and of Women’s History Month, the Erehwon Center for the Arts in Quezon City recently hosted “Amazing F,” featuring some of the country’s leading artists, both women and men. The participating artists included Glenda Abad, Ambie Abano, Yasmin Almonte, Lot Arboleda-Lee, Agnes Arellano, Adi Baens, Imelda Cajipe-Endaya, Romy Carlos, Fil de la Cruz, June Dalisay, Cheloy Dans, Biboy Delotavo, Anna Fer, Brenda Fajardo, Egai Fernandez, Tinsley Garanchon, Ofie Gelvezon, Amihan Jumalon, Joy Igano, Gloria Lava, Lewanda Lim, Vivian Nocum Limpin, Julie Lluch, Eden Ocampo, Annie Rosario, Lotsu Manes, Leigh Reyes, Doris G. Rodriguez, Jonah Salvosa, Anna Vergel, and Vida Verzosa. Erehwon—located at #1 Don Francisco St, Villa Beatriz Subdivision, Old Balara, Quezon City—is fast becoming one of Metro Manila’s most vibrant art centers, hosting not just painters but also musicians like the Metro Manila Concert Orchestra. The Amazing F show, which ran until last week, was another of its projects to benefit the Erehwon Arts Foundation, which aims to run a residency program for talented but financially challenged young Filipino artists. It was curated by Erehwon Arts Foundation Vice President June Poticar Dalisay, who said that “AMAZING F is an art exhibit that explores the different facets of the Filipino woman, a complex and enigmatic individual whose roles are varied and endless, affecting every sphere of our personal and public lives. She is warm, sweet, and compassionate, but she can also be can be cunning, feisty, and combative.” Don’t I know that—and yes, June, I stand amazed! AT THE University of the Philippines Institute of Creative Writing, we were happy to recently welcome into our ranks several new “associates”—UP colleagues who were also accomplished writers whom we felt could make significant contributions to the Institute’s programs. They were Chari Lucero, Luna Sicat-Cleto, Eugene Evasco, and Heidy Eusebio-Abad. Chari is a bilingual—indeed, a multilingual—fictionist and essayist, a very sharp reader of texts; Luna is a playwright and novelist in Filipino; Eugene, a Palanca Hall of Famer, is a writer of stories and poems for children in Filipino; and Heidi writes stories for children in English. The entry of Eugene and Heidi into the UPICW was particularly timely, since we were severely short-handed as far as our expertise in writing for children and young adults was concerned. Puppetry advocate Amelia Lapeña-Bonifacio remains on our board of advisers, but we had lost Rene Villanueva to an early death and Carla Pacis to La Salle. By bringing Eugene and Heidi into our workshops, we wanted to remind ourselves—and the reading public, of course—of the primal importance of children’s literature as a means of nurturing our sense of nationhood in the imagination of our youngest citizens. This renewed emphasis was evident at the 53rd UP National Writers Workshop, which we held last week in Baguio. At least three of our 12 workshop fellows were writers for children and young adults. Cyan Abad-Jugo, who already has a PhD in Creative Writing, is working on a book of 13 stories in the fantastic mode. Renato “Nats” Vibiesca, a Palanca award winner, teaches at the Polytechnic University of the Philippines; Marcy Dans-Lee is primarily an illustrator and artist, but also writes her own texts, often drawn from the wealth of indigenous lore that surrounds her in Davao, where she teaches at the University of the Philippines-Mindanao. Cyan Abad-Jugo: I wanted to see if I could achieve “a wider lens on ultimate reality” by making a slight detour “from direct representation of the surface of reality;” I wanted to skew it a little or reshape it a lot, and see if I could not arrive at better relevance and social commentary (which is what I thought Scholes meant by returning “towards actual life by way of ethically controlled fantasy”). This does not mean that I wanted to identify an aspect of social reality and then work it into my fiction. I never start out with such clarity of mind, and cannot give myself clear directions; my default mode is “lost mode,” and so must find my way out of the labyrinth I inevitably find myself in. Though stories never adhere to strict definitions of modes or genres, the definitions and characteristics of each kind of tale or story could serve a heuristic purpose; they could serve as guides to the writer who wants to explore the capabilities, flexibilities, and possibilities of the fantastic story, and how it expresses what we are and could become. Renato Vibiesca: The short story “Sawsawan sa Padyak” deals with the experience of a boy (with the nickname Kadyot) who grows up in Gagalangin, Tondo—specifically, his transition from childhood to adolescence while confronting his family’s poverty. The story raises questions about the self, physical change, initiation, experimentation, confusion, observations about the adult world, vice, and other instances that address this period of transition. The story also illustrates the culture, the exploits, and the strategies employed by the poor to survive and stay in the city. Even as these problems aren’t solved in their entirety within the story, it does offer hope for the protagonist who keeps on dreaming as he moves along this new path in his life. The story was written from the point of view of the protagonist, using a voice unique to a 12- or 13-year-old; often facing personal problems, tossing questions around in his mind, nudging forward and backward in his decisions…. Though often full of fear, experience and his station in life become drive him to become more creative and resourceful. The story’s main aim is to give value to how such young persons face life’s challenges. It isn’t very often that the experiences of adolescents are taken up in fiction. This stage is an eventful one, which makes it more important for readers of this age to be given guidance. The author hopes that more works—both short stories and novels—will be written along this line. believe that monsters are real; adults believe that monsters are real only in other adults. And because children believe in monsters, they have the ability to embrace “magic” in stories. As a writer for children, I depict magic with gentle care, never underestimating my little reader’s intelligence for they have been known to persistently demand “Why?” And the writer must be prepared to give them valid and reasonable magic, one that has practical logic, delicately balanced by its own breathtaking mystery. a child’s mind, because the monsters are in the book, it is logical for them to come out of it. This is acceptable magic for children; it is completely reasonable. out character parts, drawing inspiration from every child’s unforgettable characters, like the pig’s chinny chin-chin and the wolf ’s huff and puff, as well as the nightly read-aloud sessions to become an incredibly angry Papa Bear, a delicately shocked Mama Bear and a whining spoiled Baby Bear when they see their bowls of half-eaten porridge, their chairs mussed up, and their bed sheets crumpled and undone. in their young lives. When I draft a story, I unconsciously converse with a child—with the same respect I converse with adults. Simultaneously, my mind’s eye can see the illustrations that will go with the story. This anticipation allows me the luxury of fewer words since the illustrations will speak a thousand words. For after all, does a writer for children need to explain that a monster has a thin face, with big scary eyes, sharp yellow teeth and long unruly hair? Such descriptions are certainly better drawn than written. to become real in adult life. For how else can technology, medicine, green urban planning, space and time travel be imagined and made real, if not for stories of monsters and magic? IN CASE you’re wondering where “The Pinoy McManus, Part 1” is, it came out in this corner almost two years ago, on May 28, 2012; and in case you’re wondering who or what a “McManus” is, let me reprise what that first piece was all about. Jim McManus is a prizewinning journalist, novelist, and director of the Master of Fine Arts Program at the Art Institute of Chicago, whose fiction won him the Carl Sandburg Prize for the novel in 1996, and whose journalistic pieces—on everything from stem cell research to poker—have been published by the New York Times, Esquire, and Card Player Magazine, among many other periodicals. He’s been a Guggenheim and Rockefeller fellow as well. In other words, in the writing game, Jim’s no slouch, and you’ll pardon me if I’ve felt a certain affinity to him, having shared the same interests and experiences—not the least a passion for poker. The fact that Jim and I are both writers and creative writing teachers is my official excuse for posting this column-piece in Arts & Culture rather than in the sports page. Now let’s get to the fun part. Jim McManus was assigned by Harper’s to cover the 2000 World Series of Poker in Las Vegas as the backdrop for a murder investigation, but rather than watch the game from the sidelines, he decided to use his advance to buy a satellite seat (a kind of pre-tournament tournament, with a much smaller entry fee). That started an incredible run to the main event itself and, against all the odds, to the final table, where he finished in fifth place, beating out many established pros to win almost $250,000. He later chronicled that miraculous ascent to poker stardom in the book Positively Fifth Street: Murderers, Cheetahs, and Binion’s World Series of Poker, a copy of which I picked up in a second-hand bookshop some years ago. 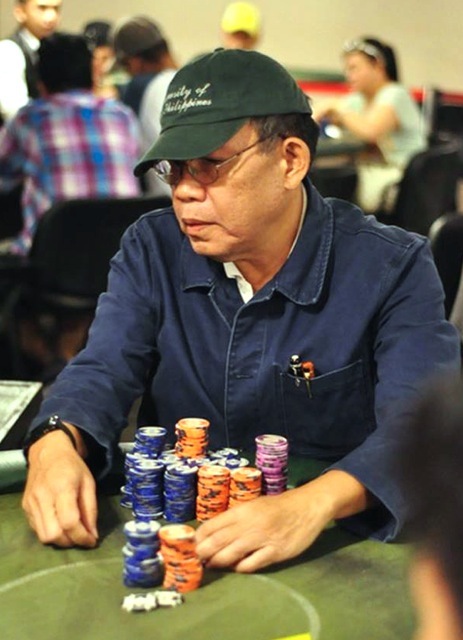 Some years ago—about eight years now, to be more precise—was when I began playing no-limit Texas Hold ‘Em poker semi-seriously, starting with beer-soaked Friday-night home games among friends and progressing to the Pagcor-vetted Metrocard Club in Pasig’s Metrowalk, where Manila’s pokerati regularly converge. Since then, I’ve spent many a night at Metro, usually on 16-hour binges, playing low-stakes poker while pecking away on a biography or an essay on my laptop and subsisting on dry saltine crackers and hot tea and black coffee. My excuse to indulgent Beng for these excursions is that I’m gathering material for my third novel, on which I’ve been at work for three years now, and which features a call-center agent who moonlights as a poker grinder. But heck, I’ll admit it, the game’s addicting, and while other old guys might prefer golf, my turf’s the green felt table, and the swish of the cards is music to my ears. I’ve learned a few things about the game and have even won a few small tournaments, but I’m still basically what the pros would call a fish, an amateur whose rank enthusiasm for playing will often get the better of him. Part 1 of my McManus article came out because I’d just then placed 20th in a big million-peso tournament at Metro, my best-ever finish at that point. Jim McManus actually read my Star column online and congratulated me for it; we exchanged messages and pleasantries, and I promised to take him up on his invitation to have coffee or a beer with him in Kenilworth, Illinois one of these days and have my copies of his books signed (I also have his definitive history of poker, Cowboys Full). Now, Jim, if you’re still out there, here’s an update from the fanboy and wannabe: last week, I did myself one better, and made the final table of another major tournament, the P1-million Metro Summer Event. A million pesos is small beans by Las Vegas standards, but the first prize could have wiped out my credit-card bills and bought me a Montblanc or two, so I was all worked up for the four-day marathon. Like Jim, I entered the MSE through a pre-tourney satellite, winning a ticket to the big game. We started out with 15,000 in chips, and at one point on Day 1—among over 400 other players in the pool—my stack went down to 7K. On Day 2 and with the pool down to a hundred, I hit a lucky streak and nursed my 40K stack to almost 380K; on Day 3, that ballooned to over 1.2 million (these are just chips, folks, not real money, so don’t get too excited). On Day 4, down to the final table of ten players, I went in as second chip-leader, but also as the oldest guy and the biggest fish in the pool of sharks. The technical details that follow will fascinate only the poker cognoscenti: I got that far in the tournament because of some of the most incredible, heart-stopping suckouts or last-card, last-second turnarounds you ever saw. At one point, my opponent drew a flush on the flop against my Q-10, but I hit trips on the turn and a full house on the river. The wildest hand of the tournament had me going all-in against the chip leader with a pair of 9s; he called, and tabled a pair of 10s: I was, 90 percent, a dead duck right at the start. The first three cards or the “flop” rolled out, none of them a 9 or a 10, but with two clubs; the fourth or turn card was the 6 of clubs. My opponent held the 10 of clubs, so he wasn’t just leading from the get-go but also had a backdoor flush draw. On the final day, after a good night’s sleep, I got up at 6, and did a 10-kilometer walk around the UP campus, running the “Chariots of Fire” theme in my head. This was my day of days; I showered, did my students’ grades and turned in my grade sheets, worked on one of the biographies in the pipeline, got a foot massage, then put on my “University of the Philippines” baseball cap and blue jacket—my battle gear—and went to the final table. I held on that night, scribbling messages to myself over the breaks on a notepad with my faithful Agatha Christie, reminders like “Keep your head!” and “Patience, endurance, opportunity!” (It was probably the doodling more than the messaging that relaxed me.) With uncharacteristic smartness, I played it safe, tossing away nine out of every ten hands, preserving my stack while I let the others duke it out. Eventually I finished in second place, bowing to a friend and previous champion, a genial and exemplarily cautious player, TV and film director Tofie Runas. The next day I brought Beng with me to Metro to claim my prize, to ensure that the money would go to good causes (I might treat myself to a pen or two, as a souvenir of the experience). “Heck, this beats the Palancas,” I told myself, remembering my first Palanca short-story win nearly 30 years ago, also a second-place finish. I could see Jim McManus grinning in Kenilworth, Illinois. He’d addressed me in his messages as “brother,” so here’s to you, brother Jim, and to all of us 60-somethings chasing thrills and spills on the green felt table.